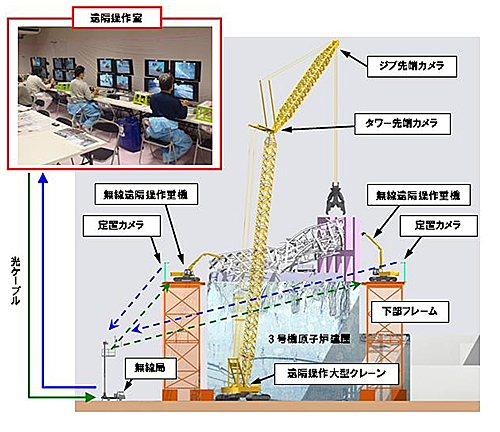 It's not just for Reactor 4 that TEPCO has been trying to build a support structure in preparation for the removal of fuel assemblies from the Spent Fuel Pool. Workers (probably from general contractor Kajima and its subsonctractors) have been busy clearing the debris from the operating floor of Reactor 3 and building a platform (or frame, as Kajima calls it), which you see in the July 24 photo that TEPCO included in the monthly report for the Working Group for Decommissioning of Reactors 1 through 4 at Fukushima Nuclear Power Plant. According to the report, the steel platform was fabricated at the on-site yard on the ocean side (east) and brought to the northwest side of the Reactor 3 building. Radiation levels on Reactor 3's operating floor are supposedly extremely high. Kajima is using remote-controlled (unmanned) cranes and other heavy equipments to remove the debris. The platforms (or frames) will be used to effectively remove the debris by remote control. According to the press release from April this year, Kajima also developed a system (patent pending) to remotely re-fuel the equipments on the platform. Thanks so much, laprimavera. Your contributions are priceless to those of us who don't understand Japanese and/or (like me) struggle endlessly with understanding all the technical stuff. I had noticed they were constructing something on the ocean side, and I did not believe it was this structure, because the actual and the illustrations differ quite a bit. These pictures confirm that I was incorrect. For some reason they have extended the "scaffold" around the Southeast corner of the building and made that extension much taller than the rest of the platform. I have to give credit to those engineers and structural workers on location - a construction of this scale in that radioactive environment is a significant accomplishment. Thanks for your efforts if you happen to read this.